Holyrood's presiding officer has urged politicians to "set an example" and not sink to the "extremely aggressive" level of debate seen on social media. 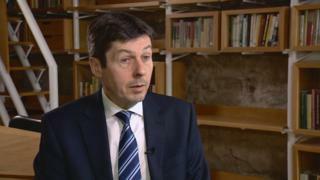 Ken Macintosh said most MSPs were "genuinely well behaved", but can get "carried away" in debates about Brexit. He was speaking at the launch of a new report on parliamentary reforms aimed at improving how Holyrood works. Mr Macintosh said a "tremendous amount" had been done, with changes to question sessions, committees and lawmaking. The independent Commission for Parliamentary Reform was set up in 2016 with the task of giving the parliament - now in its 20th year - an "MOT". The group set out 75 recommendations, and in a new report setting out how they are being implemented, Mr Macintosh said they were "already making a difference". These include the introduction of "urgent questions" in the chamber, extra sessions to question ministers and other tweaks aimed at letting more backbenchers ask questions, and outreach work to spread the word about the work of the parliament. Mr Macintosh told BBC Scotland that while there was room for "passionate" debates, members of the public get "fed up" and write in to complain when debates get "heated". The MSP said it was important for politicians to show that debates can be conducted in a "respectful" manner. He said: "Most members here are genuinely well behaved. We have Brexit debates endlessly, and members can get quite carried away in these debates. But the very same members who are arguing across the chamber about Brexit are working behind the scenes in an incredibly collegiate manner. "We already have a social media which is extremely aggressive, in which people say all sorts of things that they'd never say to each other face to face. I want the parliament to set an example - for the most part the parliament does - but sometimes it's political theatre. "There's a room and a place for political theatre too, but I certainly wouldn't like to see some of the things you see on Twitter said in this chamber, and I wouldn't accept it. I do step in every now and the and rule it out of order. "But I can tell you I'm working with people who don't wish to be rude or offensive, they're just very animated about what they feel and frustrated at the moment with politics."